Two projects saw their finish today: first up, the Vestee! Max is seen here being a tree, which is apparently very serious business. He likes it, though. See? The shawl collar read a little feminine to me, and I didn’t want to make him a sweater with a hood even if I’d thought I’d have enough yarn (which I might have had…I have a good chunk of the fifth ball left over), so I just picked up stitches and short-rowed some triangular pieces in k1 p1 ribbing to match the cuffs. I’m not 100% happy with how the neckline turned out, but I made this sweater to go with a white shirt and tie on Sundays, and I think it will work just fine for that. Next up, I made a hat to go with my Tea Scarf! You’re lucky I’m restraining myself. 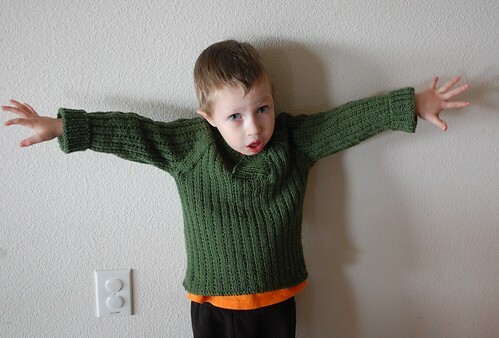 I posted four pictures of this baby in my Ravelry project folder. For….I am a Pirate King! Why restrain? More pics are always good! Love the hat! I’d want my bigger too since I have such big hair. =P The sweater is adorable and I think you did a fantastic job on the neckline. 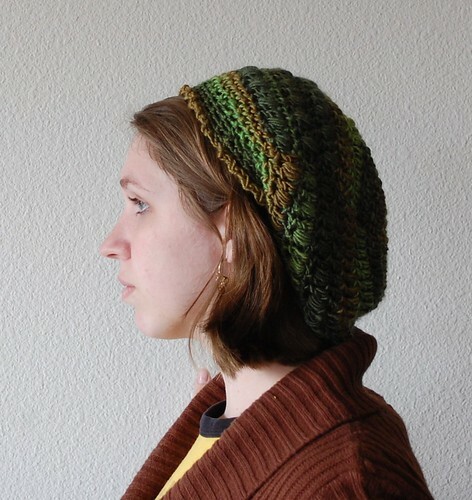 Love the hat – that yarn is gorgeous! I love the collar on the sweater…and he’s got room to grow in the sweater–in the cold–not in Texas–where he’ll need it! Both are really cute! 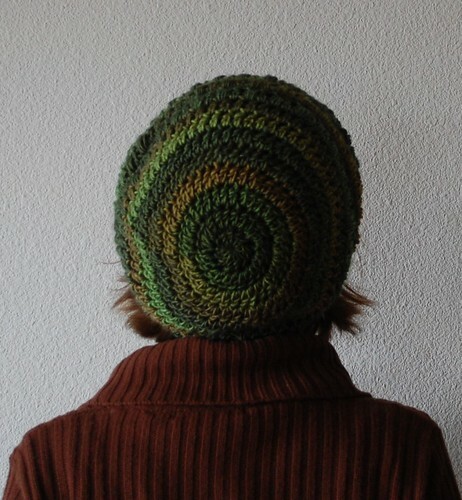 I love the yarn for the hat! I love the slouch hat. I made it for myself and another for a friend, but that yarn you used is wonderful on it. VERY cute sweater! The sweater looks wicked awesome. You are so amazing, I’ll just tweak the pattern a bit and there you go a very awesome collar. It will look very cute with his white shirt and tie. Your hat looks great too. I love the yarn color. Love, love, love the hat! 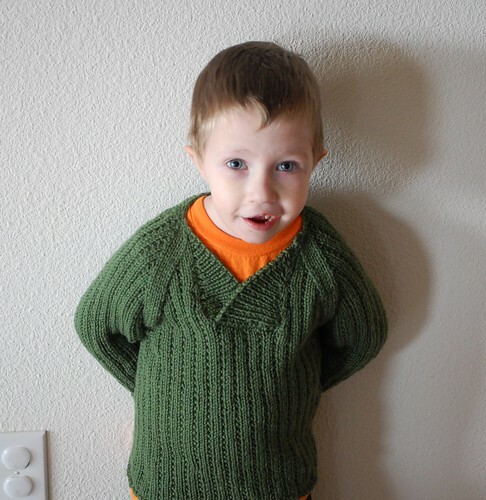 I linked to the pattern and your blog yesterday from Ravelry. I downloaded it and I plan to pick up some Debbie Mumm this week. I’ve heard it can be difficult, but I do like how it looks. Thanks for the free pattern. I love the innovative v-front collar design! I might try that on a sweater or vest for myself. Thanks for the inspiration!